The bloody red sock made its debut a year ago today. 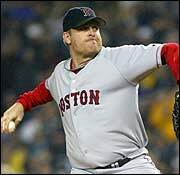 A day after having a minor surgical procedure on his ankle tendon, Curt Schilling pitched seven innings of one-run ball in Yankee Stadium to force a historic Game 7. This was also the game Alex Rodriguez slapped a ball out of Bronson Arroyo’s glove. Dan Shaughnessy: The 2004 Boston Red Sox — the wildest of wild-card entries — are just one victory from hardball heaven and the greatest baseball comeback story ever told.